The Chrysler Building is an Art Deco style skyscraper in New York City, located on the east side of Manhattan in the Turtle Bay area at the intersection of 42nd Street and Lexington Avenue. At 1,046 feet (319 m), the structure was the world's tallest building for 11 months before it was surpassed by the Empire State Building in 1931. It is still the tallest brick building in the world, albeit with an internal steel skeleton. After the destruction of the World Trade Center, it was again the second-tallest building in New York City until December 2007, when the spire was raised on the 1,200-foot (365.8 m) Bank of America Tower, pushing the Chrysler Building into third position. In addition, The New York Times Building, which opened in 2007, is exactly level with the Chrysler Building in height. Both buildings were then pushed into 4th position, when the under construction One World Trade Center surpassed their height. The Chrysler Building, as seen from Empire State Building in June 2005. Van Alen's original design for the skyscraper called for a decorative jewel-like glass crown. It also featured a base in which the showroom windows were tripled in height and topped by 12 stories with glass-wrapped corners, creating an impression that the tower appeared physically and visually light as if floating in mid-air. 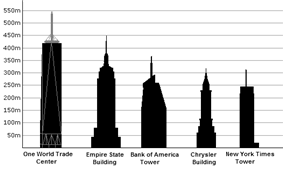 The height of the skyscraper was also originally designed to be 246 meters (807 ft). However, the design proved to be too advanced and costly for building contractor William H. Reynolds, who disapproved of Van Alen's original plan. The design and lease were then sold to Walter P. Chrysler, who worked with Van Alen and redesigned the skyscraper for additional stories; it was eventually revised to be 282 m (925 ft) tall. As Walter Chrysler was the chairman of the Chrysler Corporation and intended to make the building into Chrysler's headquarters, various architectural details and especially the building's gargoyles were modeled after Chrysler automobile products like the hood ornaments of the Plymouth; they exemplify the machine age in the 1920s (see below). Prior to its completion, the building stood about even with a rival project at 40 Wall Street, designed by H. Craig Severance. Severance increased the height of his project and then publicly claimed the title of the world's tallest building. (This distinction excluded structures that were not fully habitable, such as the Eiffel Tower.) In response, Van Alen obtained permission for a 38-meter (125 ft) long spire and had it secretly constructed inside the frame of the building. The spire was delivered to the site in four different sections. On October 23, 1929, the bottom section of the spire was hoisted onto the top of the building's dome and lowered into the 66th floor of the building. The other remaining sections of the spire were hoisted and riveted to the first one in sequential order in just 90 minutes. Upon completion, May 20, 1930, the added height of the spire allowed the Chrysler Building to surpass 40 Wall Street as the tallest building in the world and the Eiffel Tower as the tallest structure. It was the first man-made structure to stand taller than 1,000 feet (305 m). Van Alen's satisfaction in these accomplishments was likely muted by Walter Chrysler's later refusal to pay the balance of his architectural fee. Less than a year after it opened to the public on May 27, 1930, the Chrysler Building was surpassed in height by the Empire State Building, but the Chrysler Building is still the world's tallest steel-supported brick building. As of November 2, 2011, the building's height was surpassed by the under construction One World Trade Center at the height of 1,106 feet. The east building wall of the base out of which the tower rises runs at a slant to the Manhattan street grid, following a property line that predated the Commissioners' Plan of 1811. The land on which the Chrysler Building stands was donated to The Cooper Union for the Advancement of Science and Art in 1902. 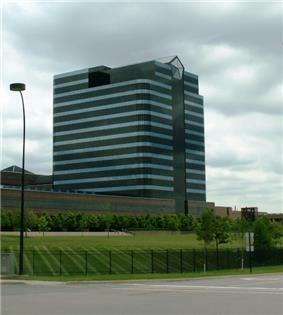 The land was originally leased to William H. Reynolds, but, when he was unable to raise money for the project, the building and the development rights to the land were acquired by Walter P. Chrysler in 1928. Contrary to popular belief, the Chrysler Corporation was never involved in the construction or ownership of the Chrysler Building, although it was built and designed for the corporation and served as its headquarters until the mid-1950s. It was a project of Walter P. Chrysler for his children. The ownership of the building has changed several times. The Chrysler family sold the building in 1953 to William Zeckendorf, and in 1957 it was purchased by Sol Goldman and Alex DiLorenzo, and owned by Massachusetts Mutual Life Insurance Company. The lobby was refurbished and the facade renovated in 1978–1979. The building was owned by Jack Kent Cooke in 1979. The spire underwent a restoration that was completed in 1995. In 1998, Tishman Speyer Properties and the Travelers Insurance Group bought the Chrysler Building and the adjoining Kent Building in 1997 for about $220 million (equal to $320 million in 2014) from a consortium of banks and the estate of Jack Kent Cooke. Tishman Speyer Properties had negotiated a 150-year lease on the land from Cooper Union and the college continues to own both the land under the Chrysler Building and the building itself. Cooper Union's name is on the deed. In 2001, a 75% stake in the building management contract was sold, for US$ 300 million (equal to $400 million in 2014), to TMW, the German arm of an Atlanta-based investment fund. On June 11, 2008 it was reported that the Abu Dhabi Investment Council was in negotiations to buy TMW's 75% economic interest, and a 15% interest from Tishman Speyer Properties in the building, and a share of the Trylons retail structure next door for US$ 800 million. On July 9, 2008 it was announced that the transaction had been completed, and that the Abu Dhabi Investment Council was now the 90% owner of the building. The Chrysler Building is considered a leading example of Art Deco architecture. The corners of the 61st floor are graced with eagles; on the 31st floor, the corner ornamentation are replicas of the 1929 Chrysler radiator caps. The building is constructed of masonry, with a steel frame, and metal cladding. In total, the building currently contains 3,862 windows on its facade and 4 banks of 8 elevators designed by the Otis Elevator Corporation. The building was declared a National Historic Landmark in 1976. When the building first opened, it contained a public viewing gallery on the 71st floor, which was closed to the public in 1945. This floor is now the highest occupied floor of the Chrysler Building, it was occupied by an office space management firm in 1986. The private Cloud Club occupied a three-floor high space from the 66th–68th floors, but closed in the late 1970s. Above the 71st floor, the stories of the building are designed mostly for exterior appearance, functioning mainly as landings for the stairway to the spire. These top stories are very narrow with low, sloped ceilings, and are useful only for holding radio-broadcasting and other mechanical and electrical equipment. Television station WCBS-TV (Channel 2) originally transmitted from the top of the Chrysler in the 1940s and early 1950s, before moving to the Empire State Building. For many years, WPAT-FM and WTFM (now WKTU) also used the Chrysler Building as a transmission site, but they also moved to the Empire State Building by the 1970s. There are currently no commercial broadcast stations located at the Chrysler Building. There are two sets of lighting in the top spires and decoration. The first are the V-shaped lighting inserts in the steel of the building itself. Added later were groups of floodlights that are on mast arms directed back at the building. This allows the top of the building to be lit in many colors for special occasions. This lighting was installed by electrician Charles Londner and crew during construction. The Chrysler Building has been shown in several movies that take place in New York. In the summer of 2005, New York's own Skyscraper Museum asked one hundred architects, builders, critics, engineers, historians, and scholars, among others, to choose their 10 favorites among 25 New York towers. 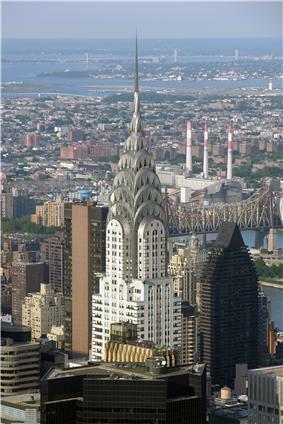 The Chrysler Building came in first place as 90% of them placed the building in their top-10 favorite buildings. ^ a b c d e f "Chrysler Building - The Skyscraper Center". Council on Tall Buildings and Urban Habitat. ^ Nash, Eric Peter; McGrath, Norman (1999). Manhattan Skyscrapers. Princeton Architectural Press. p. 63. ^ a b "Chrysler Building". National Historic Landmark summary listing. National Park Service. Retrieved April 20, 2012. 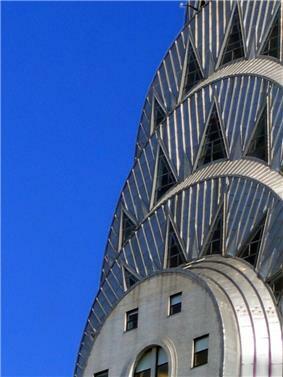 ^ "The Chrysler Building –". Skyscraperpage.com. Retrieved September 27, 2010. ^ "Emporis Data – See Tallest buildings Ranking". Emporis.com. June 15, 2009. Retrieved September 27, 2010. ^ "FavoriteArchitecture.org". FavoriteArchitecture.org. Retrieved September 27, 2010. ^ a b c d e f Pierpont, Claudia Roth (November 18, 2002). "The Silver Spire: How two men's dreams changed the skyline of New York". The New Yorker. Retrieved October 23, 2011. ^ Emporis GmbH. """Emporis Data "...a celebrated three-way race to become the tallest building in the world.. Emporis.com. Retrieved September 27, 2010. ^ """The Manhattan Company – Skyscraper.org; "...'race' to erect the tallest tower in the world.. Skyscraper.org. Retrieved September 27, 2010. ^ Emporis GmbH. "– Chrysler Building". Emporis.com. Retrieved September 27, 2010. ^ "Chrysler Building". glasssteelandstone.com. Retrieved October 11, 2008. ^ "The World's Tallest Brick Building – SkyscraperPicture.com". webcache.googleusercontent.com. Retrieved September 27, 2010. 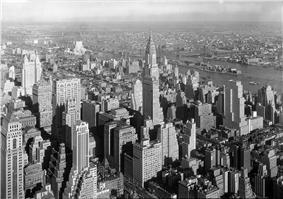 ^ "A view from Above – The Chrysler Building". webcache.googleusercontent.com. Archived from the original on 2007-06-30. Retrieved September 27, 2010. ^ a b "Cooper Union and Chrysler Building". Cooper.edu. September 15, 2004. Archived from the original on July 8, 2010. Retrieved September 27, 2010. ^ Gregor, Alison (February 13, 2008). "Smart Land Deals as a Cornerstone of Free Tuition". The New York Times. Retrieved October 23, 2010. ^ Bagli, Charles V. (November 25, 1997). "A New Owner To Take Over An Old Classic". The New York Times. Retrieved October 26, 2011. ^ Lewis, Michael J. (June 19, 2005). "An enduring hood ornament". The San Diego Union-Tribune. Archived from the original on May 19, 2009. Retrieved October 23, 2011. ^ "CHRYSLER BUILDING ON THE BLOCK – SOVEREIGN ARAB FUND TO PAY $800M". ^ Bagli, Charles V. (July 10, 2008). "Abu Dhabi Buys 90% Stake in Chrysler Building". The New York Times. Retrieved June 8, 2009. 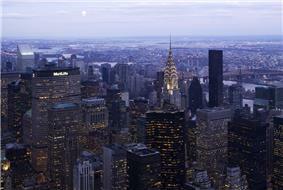 ^ "New York's Chrysler Building Bought by Abu Dhabi Fund". Bloomberg. ^ "Article: Trade names associated with stainless steels". Bssa.org.uk. Retrieved September 27, 2010. ^ Michaelis, David (March 31, 2002). "Inside the Needle: The Chrysler Building Gets Lit by David Michaelis". MrBellersNeighborhood. Archived from the original on May 19, 2009. Retrieved September 27, 2010. ^ "Contact". Reprieve.org. 1970-01-01. Retrieved 2014-05-19. Stravitz, David (2002). The Chrysler Building: Creating a New York Icon Day by Day. New York: Princeton Architectural Press. Terranova, Antonio; Manferto, Valeria (2003). Skyscrapers. Vercelli, Italy: White Star.